Having designed some of the highest-quality NASes we’ve come across in recent years, Synology is no stranger to the networked storage market. It’s interesting, then, that with as many NAS appliances that the Taiwanese company has released, it’s only just now released a router. As we find out, it’s quite good, too – ideal for the home and business user. In need of a router? You’ll want to check this one out. We’ve taken a look at many different devices over the years, from many different manufacturers. While we all have our areas of expertise, we’ve shared in the responsibilities of what to cover and how to best cover it. One company that we continue to look at is Synology. Known the industry over for its robust and stable NAS offerings, the Taiwan-based company grabbed our attention last summer with the announcement of its wireless router, the RT1900ac. This is a natural progression of brand development if you think about it,expanding out from storage attached to your network to the device that controls the network. 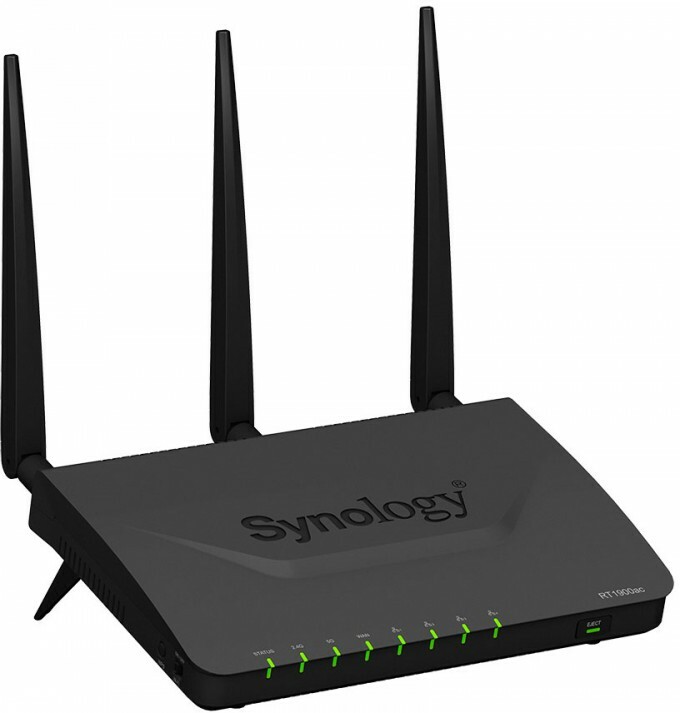 The announcement of a router from Synology was, and is, exciting news. With wireless technology continuing to outpace that of connected devices in the home, the market has been able to bear products from a myriad of companies. What excites us most is the software running on the RT1900ac. DiskStation Manager (DSM) has been the crown jewel of Synology’s offerings for years. Being, in our opinion, the easiest and most intuitive to navigate for novices and advanced users alike, DSM has been the gold standard for quite a few years. This isn’t to say that the hardware has been neglected. The aesthetics of its offerings have been top-tier for as long as we’ve been covering the company at Techgage. What we mean is that as good as the hardware has been, the software that runs on top of it has been the true Synology experience that has been sold to consumers for years. With all that it’s learned, Synology has branched out into an entirely new yet related market: home networking. With it comes Synology Router Manager (SRM). The RT1900ac, as the name implies, is a wireless AC router providing combined speeds up to 1900 Mbps. For the uninformed (read: an alarming amount), this sounds like a ridiculously fast offering – and for home networks it sort of is – but we must always keep in mind that the advertised speeds are theoretical. Oh, and there is some marketing addition that takes place too. Because, numbers. See, wireless AC routers are almost entirely dual band. I can’t actually think of, or find any, that don’t at least offer a simultaneous 5 GHz and 2.4 GHz radio, so any advertised speed is going to be the sum of at least two numbers. There are some that are tri-band, but that’s for another review. The 2.4 GHz band offers either 450 or 600 Mbps speeds. The 5 GHz AC band offers 1300 Mbps. You add those two numbers together (dependent upon the wireless n radio used) and you get either 1750 or 1900 Mbps. You can guess where the RT1900ac gets its name. It’s dumb, but it’s marketing and it’s how every company brands their routers. We can’t fault Synology or any of the other manufacturers individually for how we ended up with this naming convention. Anyone looking for a new router for their home or small office needs to understand that they will never see speeds of 1900 Mbps to and from one single device. You won’t ever actually see speeds of 1300 Mbps for that matter. As long as you understand this going into any router evaluation for yourself, you’ll be all the better prepared to make a decision on what to buy. Out of the box, the RT1900ac feels like a quality device. The physical demands of a router are not great, but there is little-to-no flex in the router and the unassuming styling of it should allow it to fit in with any home décor, regardless of where it’s positioned. With three external, MIMO omni-directional high-gain dipole (2.4GHz / 5 GHz) antennas, the RT1900ac looks like almost any other dual-band router with external antennas. My personal router is, and has been, the ASUS RT-AC66U. The RT1900ac resembles that one quite a bit. All this proves is that there are only so many ways you can position three antennas on a small black box. Packaged with the RT1900ac is a power cable of almost laughable length, an Ethernet cable, a stand for positioning the router vertically, and an adapter for North American, two-prong, power outlets. The router itself has the buttons, lights and switches that we have come to expect from a device of this nature. With a button for WPS activation, a switch for toggling wireless broadcasting on or off, a USB 3.0 port for attaching storage, and an ejection button to safely remove said storage, the RT1900ac is rather pedestrian in physical offerings. One curiosity however is the addition of an SD card slot. Synology states that this allows for quick sharing of pictures taken on a camera with anyone who has access to the router. In theory this seems like a nice addition that might help set Synology’s first offering apart from the competition, but in practice, I will be interested to see how many people actually use this. I do like the idea of using the router as a syslog server, storing the logs on extremely cheap SD storage. The RT1900ac, on paper, is missing nothing we’d hope to see in a quality router. The hardware is just one aspect of a router, though, so let’s dive into a look at the software and performance.